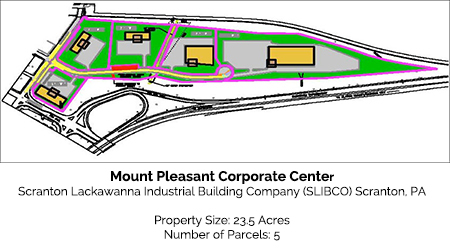 Skibinski Associates was commissioned by SLIBCO, the industrial development arm of the Greater Scranton Chamber of Commerce, to prepare a comprehensive masterplan and develop roadway, utility infrastructure and future building pad design for the proposed Mount Pleasant Corporate Center. The 23.5± acre site, immediately adjacent to Scranton’s central business district, is designated a Keystone Opportunity Zone (KOZ). Professional services include: topographic and boundary surveys, building demolition package, engineering design (roadway and infrastructure), preliminary and final subdivision plans, right-of-way plans, utility relocation, wetland delineation and report of findings, wetland mitigation, traffic impact study, a Phase II testing program for an abandoned underground oil storage tank, geotechnical engineering program, and asbestos abatement evaluation of an on-site building. widening of West Linden Street, utility infrastructure consisting of a gravity sanitary sewer system, domestic and fire protection water distribution systems, electrical and telecommunications infrastructure, gas distribution, stormwater management, NPDES and E&S permitting, a PennDOT Highway Occupancy Permit (HOP) for off-site roadway widening to provide a separate left turn lane to the North Scranton Expressway, an additional left-turn lane at the Expressway’s Seventh Avenue exit ramp, stormwater modifications, traffic signal modifications, and ramp pre-emption, land development, approval acquisition, contract document preparation, cost analysis, bidding assistance and construction administration services. Project funding is partially through grants and loans from the Commonwealth of Pennsylvania and an EDA grant and the City of Scranton Office of Economic and Community Development (OECD).